LocationAnywhere between Falmer and Felpham. 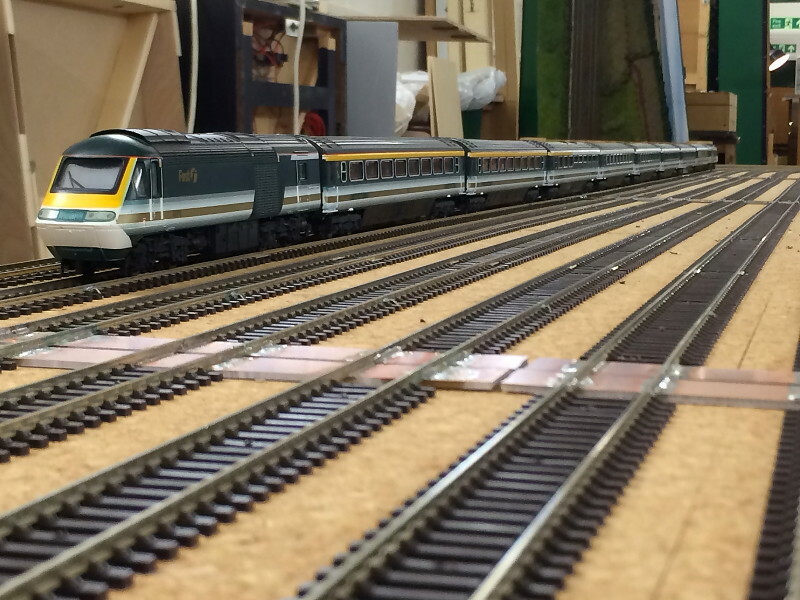 Wow, that fiddle yard is looking great / big. Can't wait to see it filling up. Wow, that fiddle yard looks awesome. 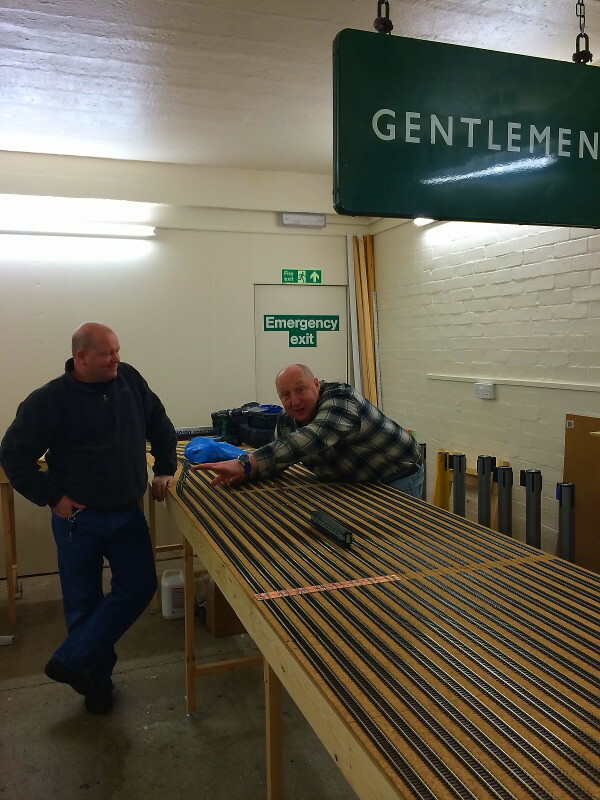 All the track now down in the fiddle yard and on the new scenic boards. Time to get the wire and soldering irons out, start wiring in the power and install all those point motors. Hope to get some pics up later in the week. Whenever I work on my layout there is normally biscuits and dandelion and burdock... And still nothing happens! Good news about Salisbury James, If I'm off then I'll be there..
How easy will it be to fill that FY?? We've all got bulging stock boxes of toys (which strangely seem to get bigger following every exhibition with Martells's stand present) so we'll soon be jostling for space again I'm sure! Best thing is we can now fit longer freight trains and mmmm...perhaps Eurostars... Haha! 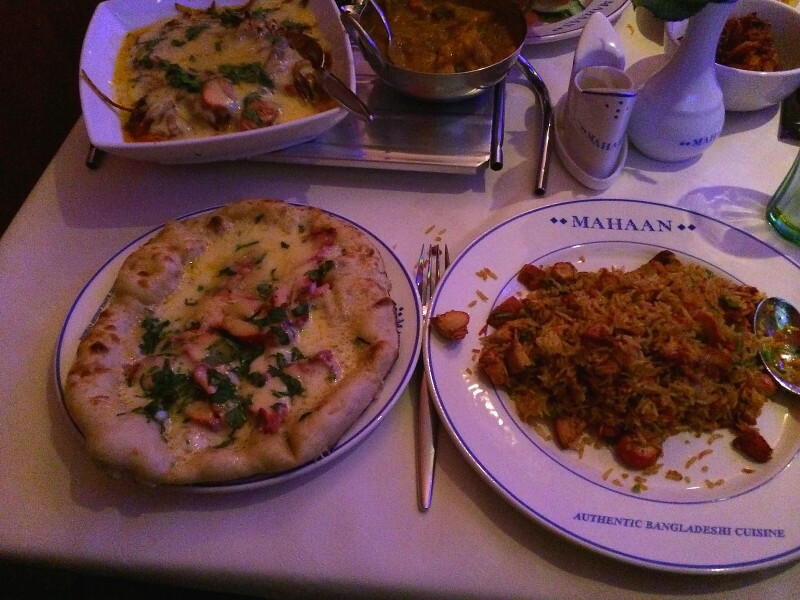 Further to our previous updates, we've just come back from a superb Loftus Road curry, I present Worthing's finest, the behemoth that is the legendary Chicken Tikka Pizza Naan! Of note is the stalwart Lima Mk3 coach, the first rail vehicle to traverse the new fiddle yard. As Pete Hollman's special test vehicle, it is fitted with extra wood pieces for loading gauge purposes and has survived in frontline service for many years testing new trackwork and platform clearances on both versions of Loftus Road and I'm sure many more layouts in the future! Following a thoroughly good curry, we are now working out strategy to complete the essential tasks in time for our Salisbury show in May, the wiring beckons! Great work, great layout too, interesting one to follow. 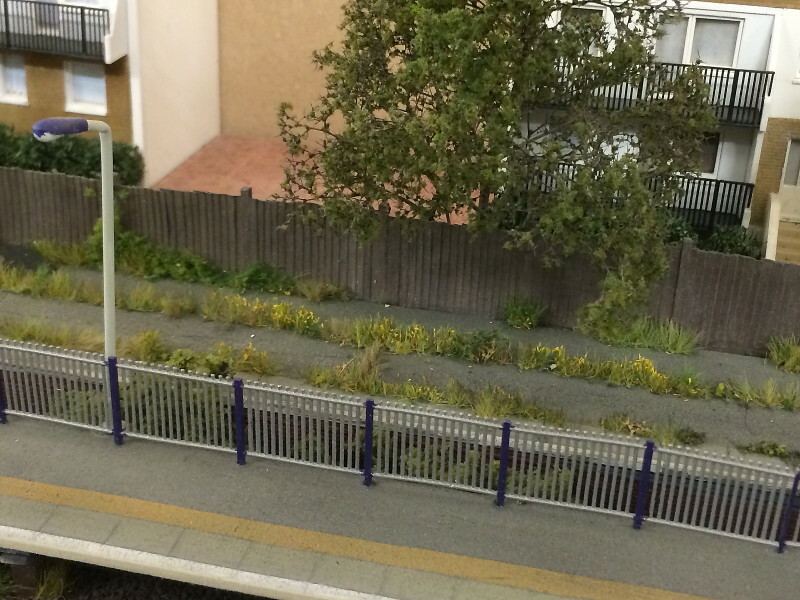 With Christmas out of the way, work begins again on Loftus Road and the planned layout extension. 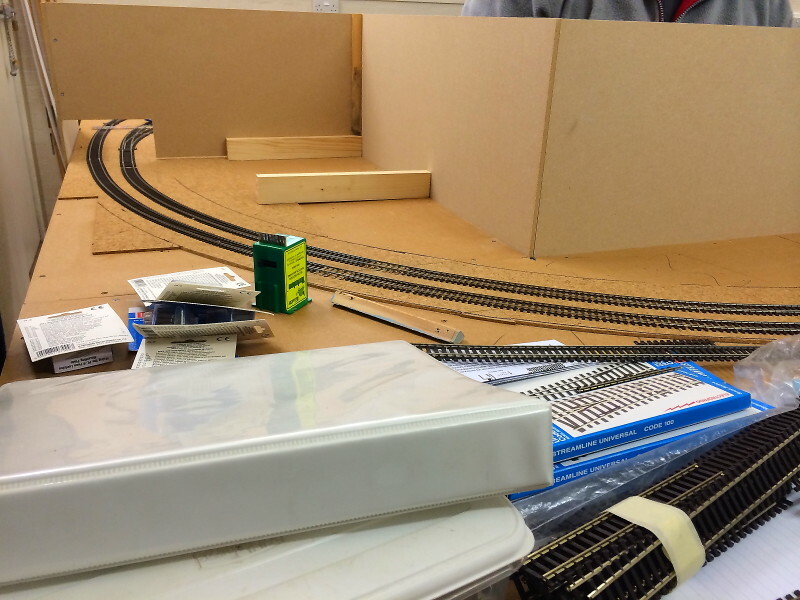 The track in the new fiddle yard is all fully laid, and work on the board joins nearly complete. 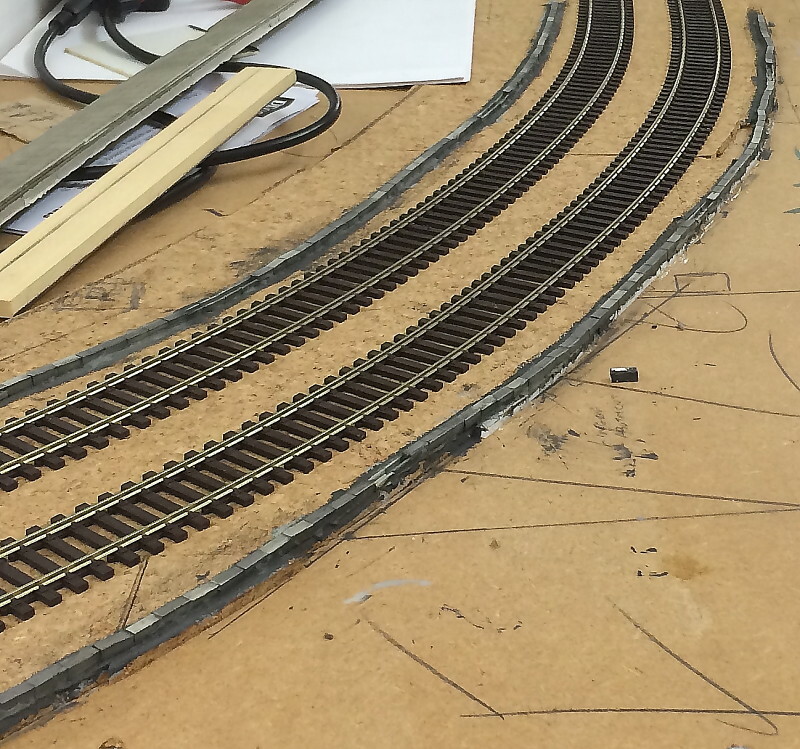 The layout's 'curves' that linked the scenic section with the fiddle yard have long been ditched, to be replaced with fully scenic'd front boards. Here was can see the Loftus Road Wrecking Gang in action with a controlled demolition of a bridge that Network Rail would be proud of! 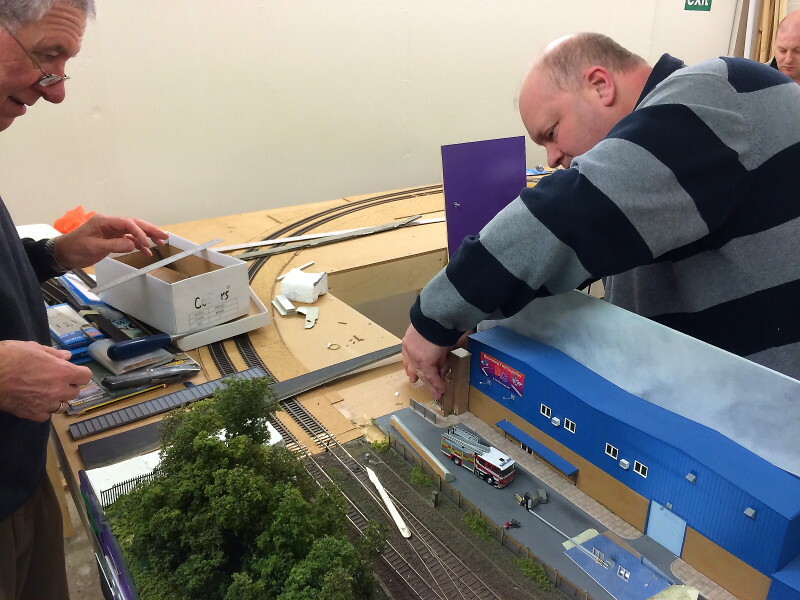 LR team member Mike (left) is tasked with turning the old low-relief bridge into '3D', and it was decided that the simplest route was to construct an entirely new bridge. Here we can see Mark (right) tackling the old bridge pier, shortly followed by careful removal of the roadside flowers scene, for careful reconstruction on the new structure! 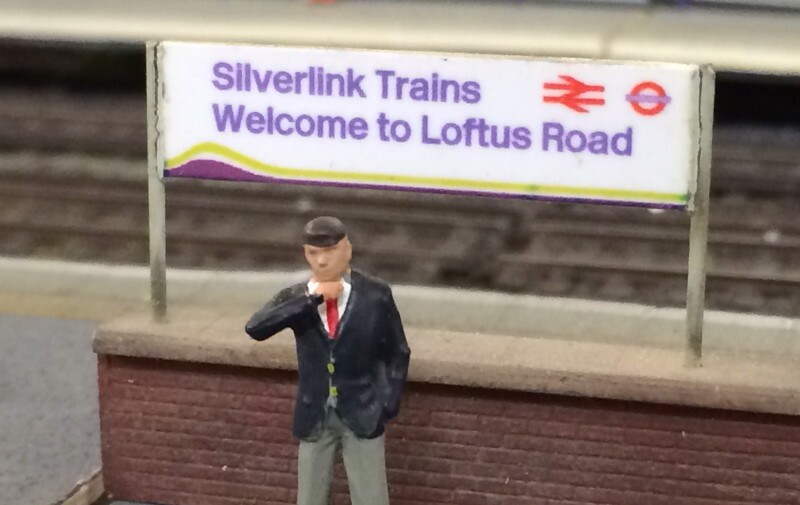 Meanwhile in other news, Loftus Road is gaining an HST! Should be fun when complete! 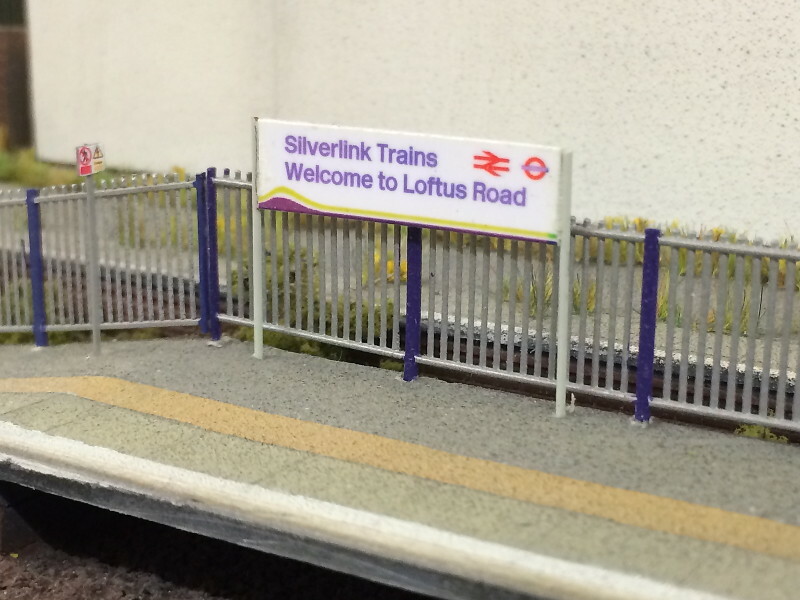 Next on Loftus Road - we will be separating the new boards for the first time, work will start on wiring the layout, and some of that bare wood might see some scenic action! These include both the old and new sections, and are built to a greater height, allowing for taller buildings, more sky and less of us appearing in the viewers eyeline! Exciting plans are being made for the scenery in this corner, watch this space! Pete has been wiring the front boards again, splitting the two main lines so that each as its own DCC feed, ready for the installation of the PM42 board (see post 41 above). He has also added the point motors to the new front scenic board, along with the Lenz bus wiring for the new boards. Round the back, Mark, Martin, Spanksie and others have been wiring the new fiddleyard, again in preparation for the separation of each side into two distinct DCC zones which will eventually feed into the PM42. For the curious, we will not be trying to run the Lenz bus to work with the Digitrax version, although I understand that there is a converter for doing this. We are aiming to test run the first locos around the layout by mid-March...ducks and runs fast after making rash public promise! On 10th April we successfully completed a full circuit on both up and down lines. Now that the power to the track has been completed all the ancillary electrics can begin - further updates to follow. 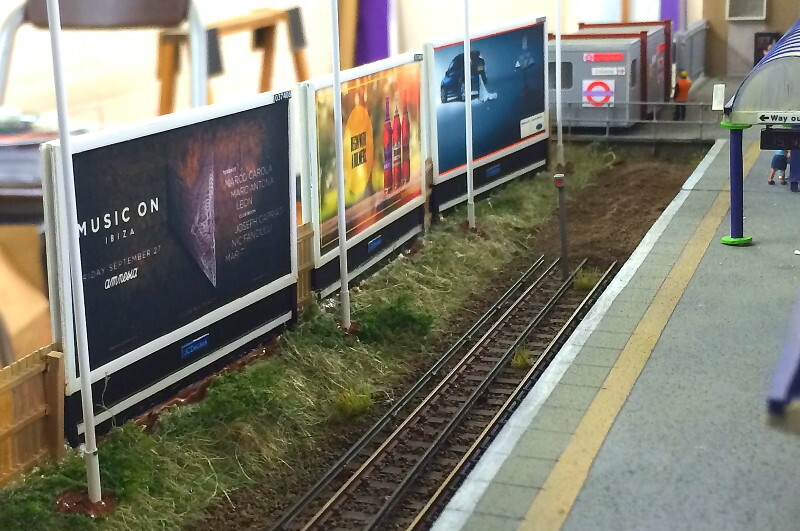 A few more shots; I've refreshed our billboard display for 2014, and a few extra details! 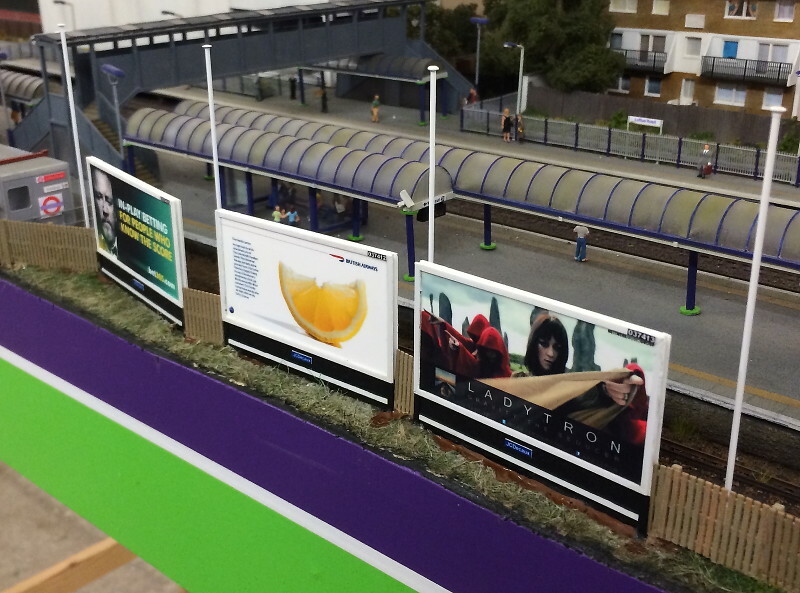 Inspired by the real Kensington Olympia, I've tripled our advertising space! 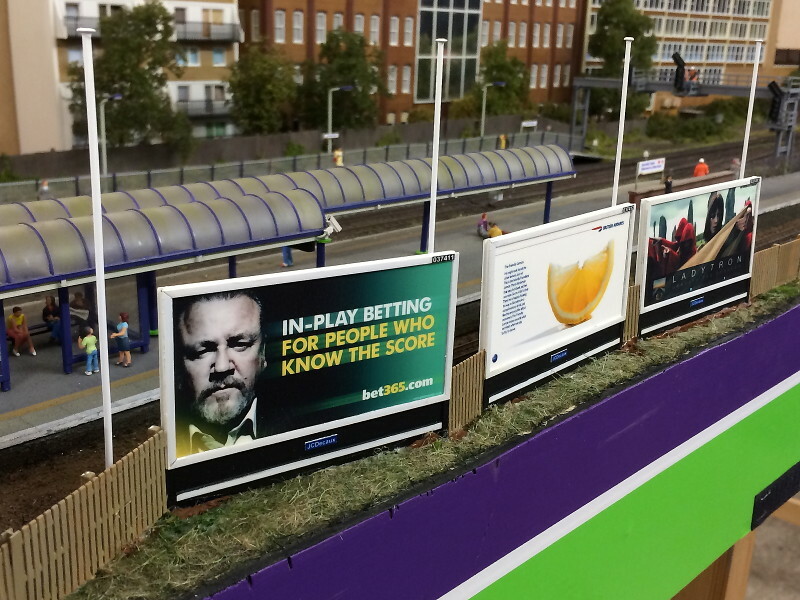 There are three 48-sheet billboards adjacent to the Underground line, between the station and Olympia, along with a nice fence and a few flagpoles...be rude not to model it! 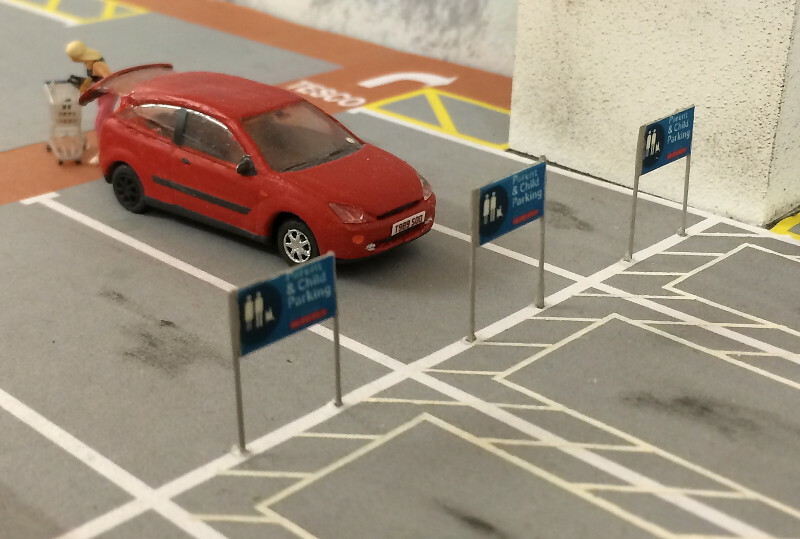 We've got some great new creative featured this time around, of course the classic Focus ST advert still features again! 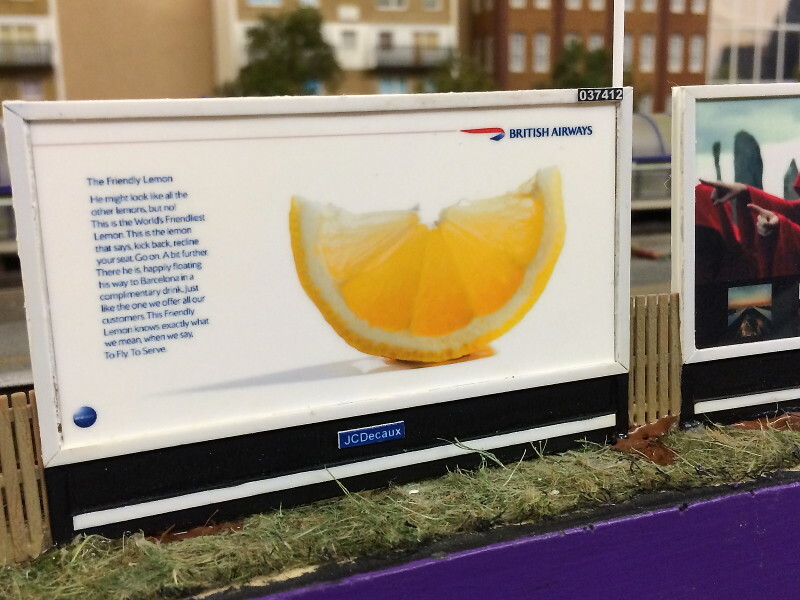 I couldn't help but go for something 'close to home' as well... one of our 'Friendly Lemon' campaign billboards scaled down from a giant file copy of the actual billboard creative from the agency, chuffed with how it came out! 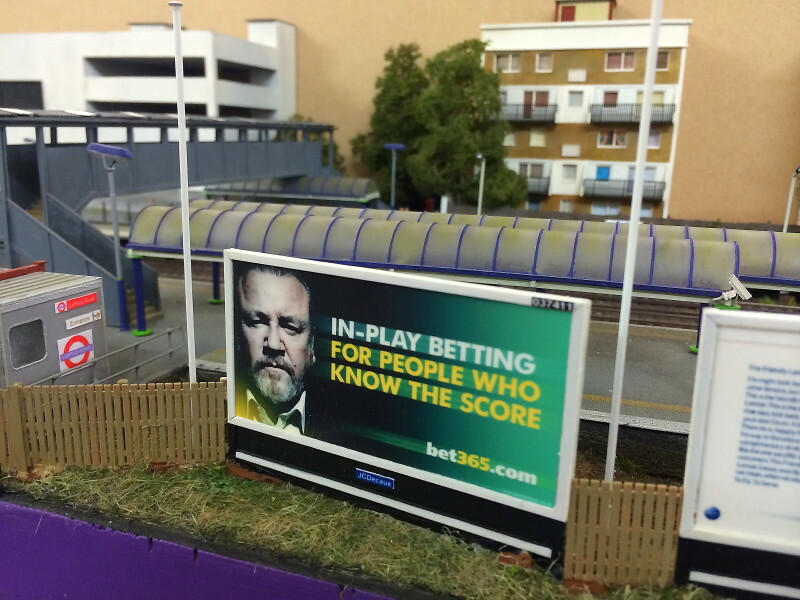 The Kensington flagpoles were added for a touch of sheer eccentricity on a layout, where else do you see them, why not! Great pics James, and as always first class modelling. Good taste on both counts, BTW! 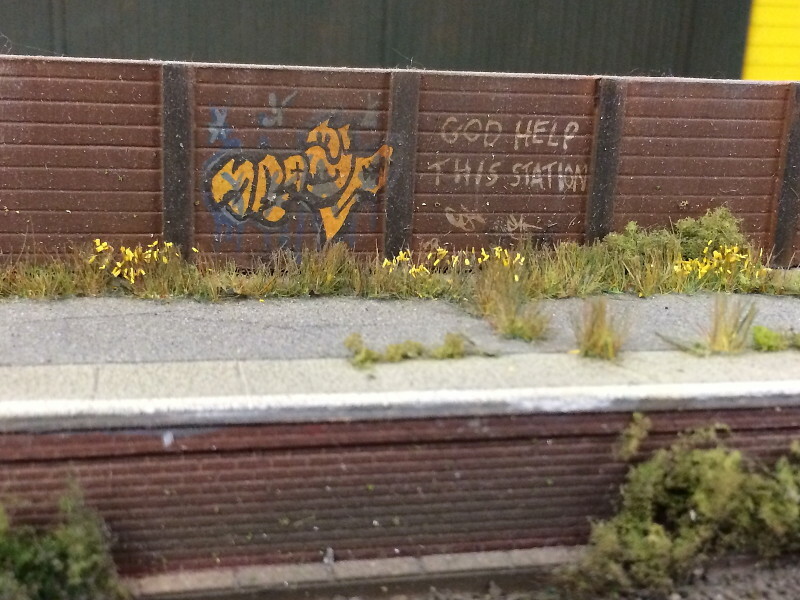 Scenery on the new boards is now well underway. I've been tasked with tackling the cable troughing and given the gorgeous weather, gone for an alfresco modelling session - it's like Ibiza with plastruct!! 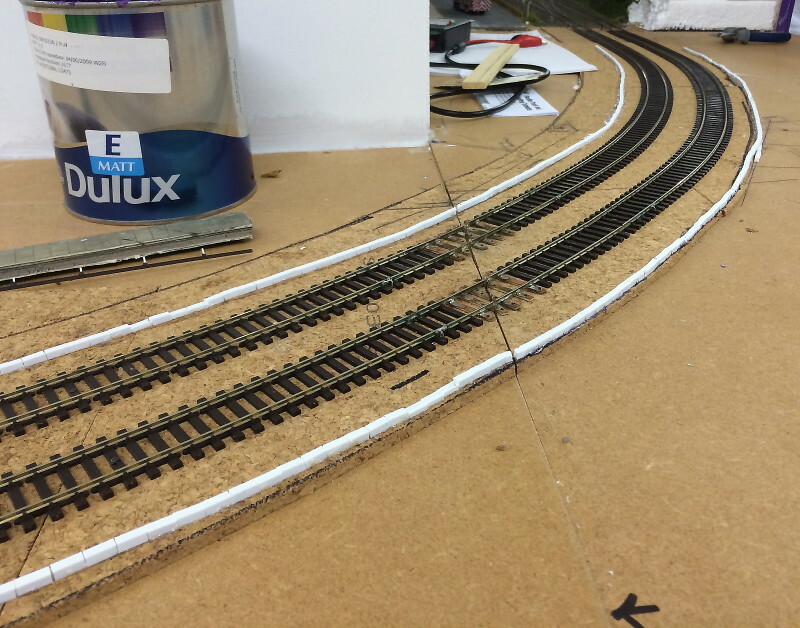 Well it's been a while since the last update, but despite sweltering weather and violent thunderstorms the gang have battled on to make Loftus Road ready for our upcoming debut at Worthing MRC show on 27 & 28 September. 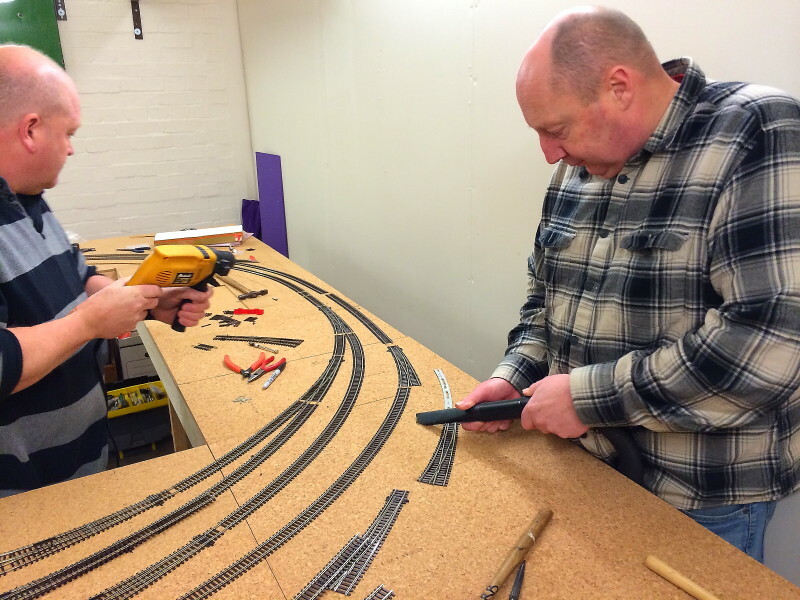 Pete, Chris, Mark 1 and Mark 2 and the gang have been busy connecting the new fiddle yard boards, installing point motors, wiring up the vast array of new pointwork and electronics for the new control panels. 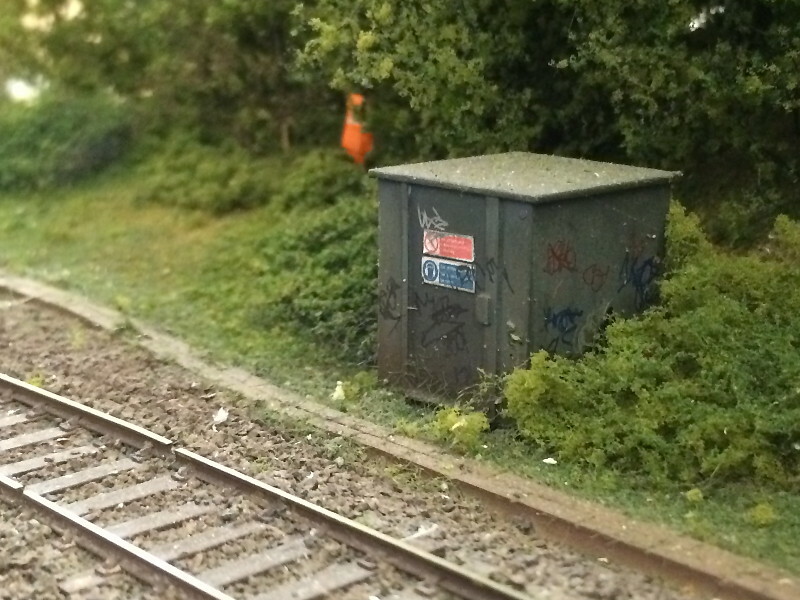 With the major permanent way being taken care of, I've been (unwisely) entrusted with doing some of the arty farty scenery bits, including some sizeable new bolt-on West London cityscape scenes which are in development and also some of the track detailing. These are all individual bits of Plastruct square, chopped to the correct size and interspersed with actual 'U' channel so we can lay some cables inside where lids are missing, and also model the instances where the lids crack in two and drop down into the gap. I painted these with a blend of greys and weathered using a few darker greys and the paint-on/wipe-off method. 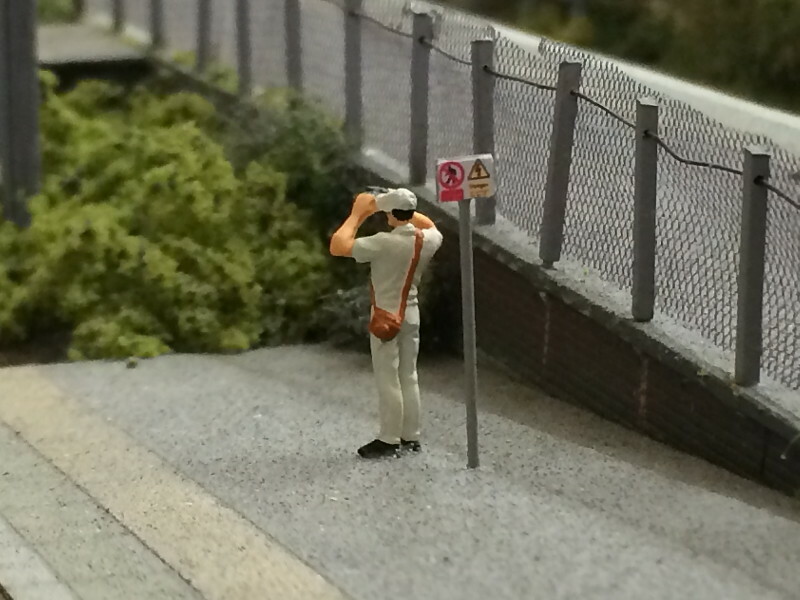 We're constantly trying to add more detail onto the existing centre boards, I've just installed some more platform signage this week but here's a few other lineside details which aren't always so noticeable at first glance! 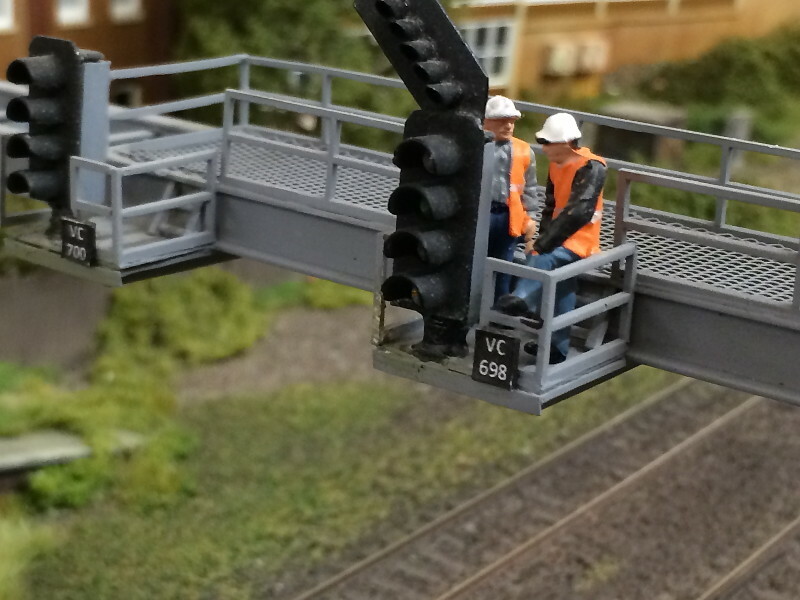 Network Rail get to work on the back of VC698, on the signal gantry scratchbuilt (with working signals) by Pete Hollman, while below we have the secluded equipment hut with someone in the background cheekily relieving themselves! 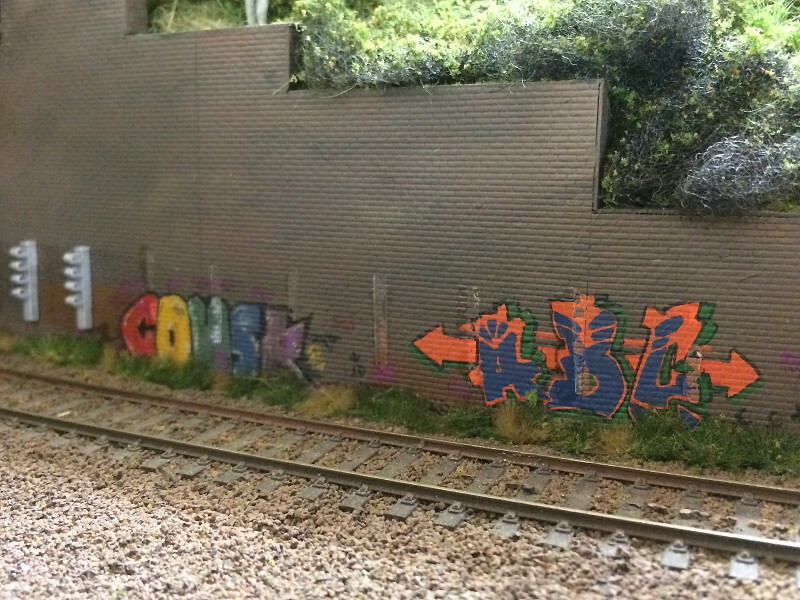 Then we have the legendary graffiti below, shamelessly copied from the real Kensington Olympia, which could be seen on the station fencing in the mid-2000s. More signage has gone in lately, including the 'don't you dare walk off the platform' signs, naturally with a trainspotter who has decided to go beyond the line...perhaps there's a steam special approaching!! But it's not all about the railway, the surrounding London is gradually being modelled and the existing Tesco car park is due to have another storey added on top in due course! 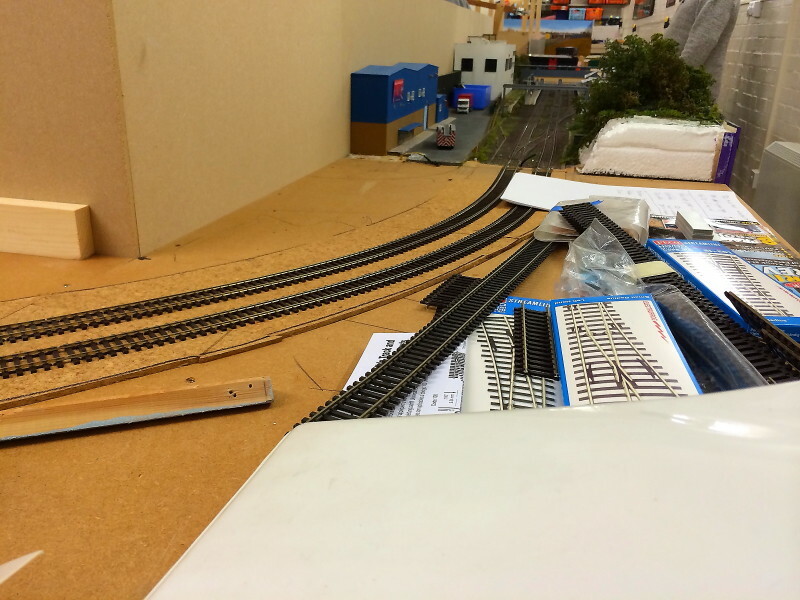 There's many more exciting jobs to be done but the race is now on to get the layout fully functional for the Worthing show, and those blank gaps of MDF will get filled - it'll be alright on the night!